The US company has been rapidly expanding its footprint across Dublin in recent months. 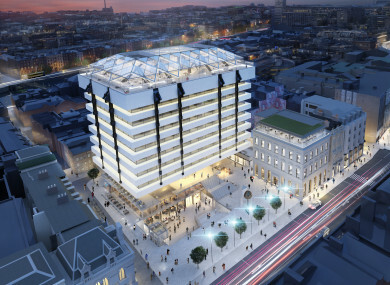 SHARED OFFICE SPACE provider WeWork will be the anchor tenant of the soon-to-be-redeveloped One Central Plaza in Dublin city centre. Last week, planning permission to overhaul the former Central Bank headquarters was granted by the national planning authority. The plans include the installation of a new bar and 360-degree 300-seat rooftop restaurant. The office space in the building will also be revamped and have space to house 1,300 workers. The building’s joint owners, Hines and the Peterson Group, confirmed that WeWork has leased the entire eight floors of office space – a combined area of more than 6,500 sq m.
The office space is expected to be ready for occupation in the final few months of next year. The US-based Hines and Hong Kong firm Peterson paid around €67 million for the ex-Central Bank offices and nearby buildings on College Green. This announcement is the latest in a string of Irish-related moves by WeWork, which has been rapidly expanding its presence here over the past few months. Last week, the US firm, which leases out office space to startups, small- and medium-sized companies and multinationals, officially opened its first Irish space in Iveagh Court near Harcourt Street. At the opening, WeWork announced that tech giant Microsoft and online communication firm Twilio will be two major tenants in the block. The plan to open in Iveagh Court was announced late last year and months after releasing details of its first space WeWork revealed it would also be opening another space in Dublin’s docklands this year. It signed an agreement with property firm Ballymore to lease a near-10,000 sq m space at No 2 Dublin Landings, a new office block being developed by one of Ireland’s best-known developers, Sean Mulryan. Hot desks cost €390 per month and dedicated desks are €470 per month at Iveagh Court. Private office areas that can seat between 21 and 50 employees are also available at rates of between €13,400 and €24,900. In addition to the new Dublin docklands space, WeWork has also agreed to lease 4,600 sq m of the former Ulster Bank Dublin headquarters at George’s Quay. WeWork was set up eight years ago in New York by Adam Neumann and Miguel McKelvey and now has 230 locations in 74 cities across 22 countries. Its expansion in Dublin is part of a wider focus on expanding its European presence. The company is snapping up office space rapidly at a time when Dublin is suffering from a shortage of office space in prime locations. Due to the shortage, commercial property specialists CBRE Ireland have tipped co-working spaces to be big winners since they have the capacity to accommodate new entrants to the Irish market who are struggling to find prime premises for staff. Other new players in the Dublin market include Iconic Offices and Huckletree, while Republic of Work opened in Cork have last year. Email “Shared office giant WeWork will lease all of the Central Bank's old headquarters”. Feedback on “Shared office giant WeWork will lease all of the Central Bank's old headquarters”.